Own Your White Privilege – Trees & Flowers & Birds! Since I wrote this post: Dear Trayvon last year, you knew I had to react to the verdict after the trial of George Zimmerman. Let me share with you some things I’ve learned over the last year and a half. I HONESTLY had NEVER heard of, or at least, internalized the concept of White Privilege before last year. That post in reaction to Trayvon’s murder was me expressing myself rather passionately after truly coming face to face with what it meant. That it means my sons can walk around without worrying about HALF of things that non-white people have to worry about. Yes, I say “non-white” not just black because that is the reality in America. I think back to over a decade ago when my Chinese American boyfriend described to me how he was profiled on the streets of the house he had purchased. A neighborhood of over half million dollar homes back then. He was driving a bit of a “beater” car as he called it since he used to have two jobs and his second job was in food delivery. He wasn’t going to risk the wear and tear, and food smells in a nice car when he did that job. He was questioned outside his new home twice as the homes were under construction. Once by a security cop tasked with keeping an eye on the newly framed homes, and once by a policeman patrolling the area. On one occasion there was another soon to be neighbor – white – also checking out his new property who was not approached. White privilege on display. Now I need to introduce you to some folks who have exposed me to the continuing concept of it that has made me more deeply aware of how it is all around me, all the time. 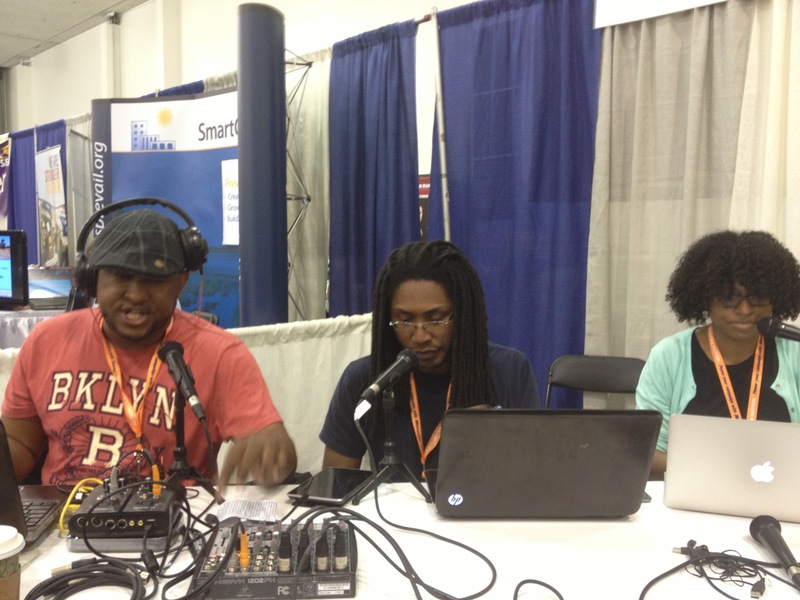 Elon James White, Aaron Rand Freeman and Dacia Mitchell aka Team Blackness from the ThisWeekInBlackness podcast. I’ve been listening to all their shows since before Trayvon, but no voices have been more clear and reasonable on the topic than theirs. This pic is from NN13 in San Jose when I was lucky to sit in front of them as they broadcast from there. I’m not getting into that here, that will be a post on my other site as I continue my NN13 write up…BUT…last night after the verdict came in, they jumped online at the spur of the moment and started broadcasting live and taking phone calls. Three hours last night, and another three this morning. Just letting people vent. And no, not all black people. In fact, one of the first calls that really stuck in my mind was a white teacher from the midwest teaching mostly black children who wanted to know what he could do for his students. He wanted to make sure he knew the right way to let them talk and direct and hopefully ease their anger and anxieties. Allies like him are golden. But then there were many moms and dads calling in. Expressing fears and anger similar to my first post. How their children cannot walk through their days in the same way that white children can. A mom talking about how her 13 year old cried upon learning of the verdict and expressed how the results sent him the message that he was expendable. That was a really hard message to hear. But, I get it. There is a constant message out there that (as Jasiri X wrote in his song about Trayvon) “Only white life is protected in America.” I never thought about that, and of course I don’t want to believe that it is ALWAYS that way 100% of the time, but I am certainly completely aware that it IS that way a vast majority of the time. I get why the callers expressed feelings of still not being completely valued as 100% American citizens in their own country. Look at the recent ruling about the Voting Rights Act. There are some deeply felt opinions – amongst the straight white males seeped neck deep in their privilege – that racism is not a problem anymore. Oh, they are so wrong. It is different to be sure, but it is not GONE. Aaron called in and expressed his sadness at learning that a good friend – a “brother” who he loves, but who is white – displayed his white privilege last night in reaction to the verdict. He referred to Trayvon as a troublemaker. A thug, just as the defense had so effectively argued. In other words, as Aaron said, his friend thought Trayvon was “shootable”. You could hear the hurt in Aaron’s voice. Some people don’t get that it had NO bearing on the case what Trayvon had done before. He was not expendable. not shootable. Not a valid target for arbitrary elimination. There are white people who think that they are not racist, and they probably are not 100% of the time. But like Aaron’s friend, they also have bought into some narratives about black men that influences their opinions on their value. This friend really does NOT understand, or empathize, with the reality of Aaron’s daily life in New York when he can be stopped and frisked for no earthly reason. He doesn’t GET that they could be walking together, and Aaron would be stopped, and he would not and the worst part is, he probably doesn’t think that would be a problem. Well, he would think it was unfair if it happens to Aaron because he knows Aaron isn’t a “thug”, but he doesn’t think it would be a problem for most other black men. White privilege AND unconscious racism right there. I think the one that struck me the deepest though was the last call of the night. A fourth generation military veteran. Black. Who cried talking about how he still isn’t free in his own country. He makes sure he has a veteran tag on his license plate so that WHEN (not if) he is pulled over the cops will see he served his country and maybe not hassle him too much. The same country that looks at him with wary eyes. That clutches its purse tighter and walks over to the other side of the street of slides further away on the park bench or bus. Because he is *never* seen primarily as one of US, but as one of THEM. A scary black man. Though he has done nothing to deserve that. He wept talking about how he LOVED that when he was in Germany, if he was harassed, he knew it was for being an AMERICAN. And only that. When he comes home, he is harassed for being black. He still doesn’t feel like he belongs. Whites have privilege. My older son has had multiple run ins with the law. But I never feared for his life or safety. When he approached the many judges he did, I never felt he wouldn’t get a fair shake. He was hampered and delayed in clearing up his court issues due to his own lack of responsibility and money. But, he is done now. He’s cleared all his cases and debts and will have his driver’s license back next week. I have a hard time believing that if he were black, it would not have been much worse. Talk and listen to people not like you. Empathize with their situation. Be an ally. Recognize and own your white privilege. Because every time one of us does that, it loses a little of its power.